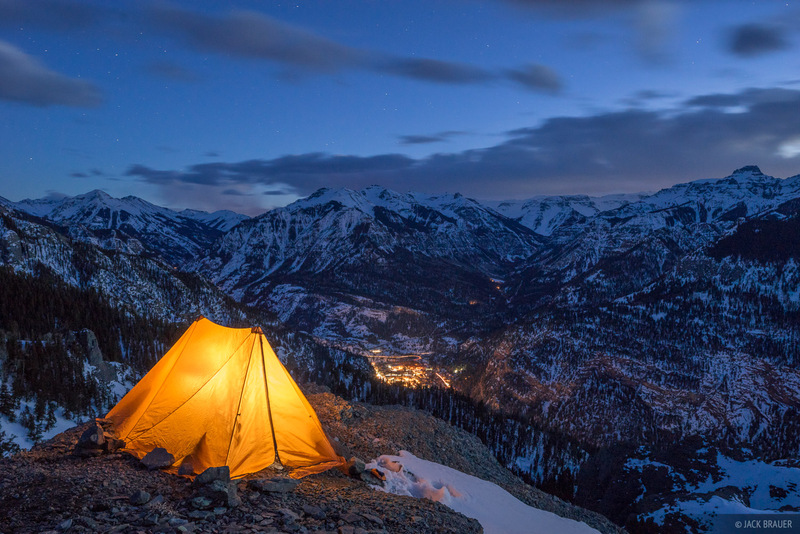 I headed out yesterday for a night of winter camping up on the “lower” Bridge of Heaven overlooking the town of Ouray, Colorado. I've winter camped up here once before five years previously, but this time I found a ridiculous spot to pitch my tent, right on the point of a precipitous rock outcropping! This airy perch provided a spectacular scene for tent photos, as well as an island of dry rock amongst the snow to cook and relax in ease. 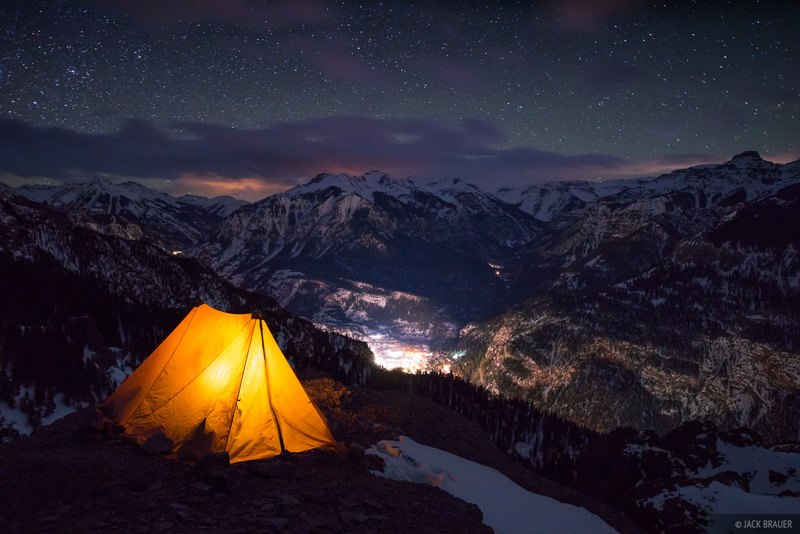 Winter camping on a high ridge over Ouray, Colorado. 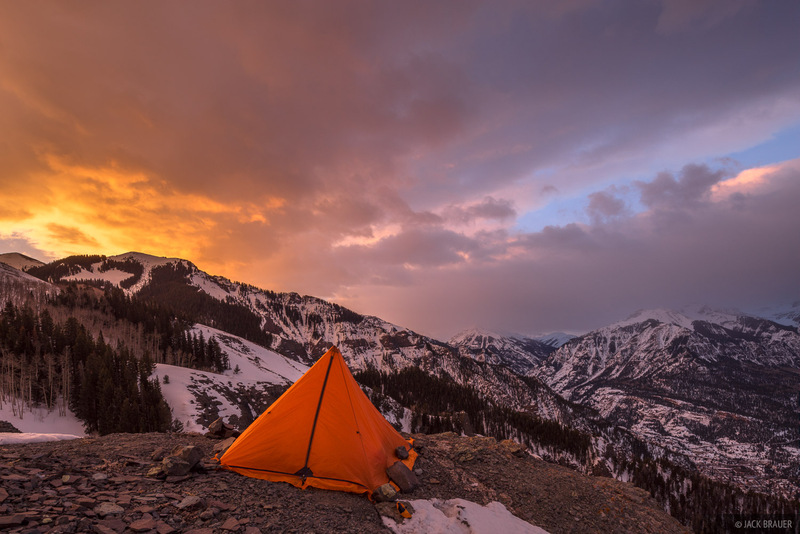 The evening was calm and quiet at first, but once I got into my sleeping bag the wind whipped up and shook the tent all night long. Though I knew the tent was solidly anchored down with rocks, the unnerving ruckus kept me awake most of night anyways. A winter sunrise on Bridge of Heaven. The morning brought a colorful sunrise along with a quick morning snowstorm before I packed up and headed back down. Thanks to Steven from Texas whose infectious enthusiasm to get out for some winter hiking ended up inspiring me to get out and make the trip!